Asia if full of exotic, busy and breathtaking destinations, one of them being the small city-state of Singapore. With this freshly found Washington to Singapore airfare you can travel there for $866 r/t with fees and taxes. 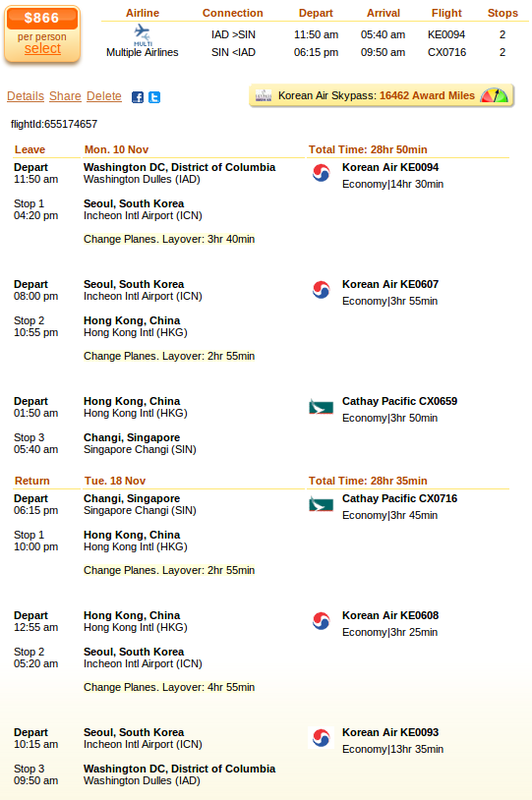 If you fly in November, you will travel both with Korean Air and Cathay Pacific on a multiple airlines flight. Our deal hunters have found this Singapore airfare on Travelgrove, but it was originally provided by Faregeek. Search as many merchants as you can is the box, compare their prices and find the lowest fares! As the screenshot shows, your flight departs on November 10 from Washington Dulles International Airport (IAD) and flies back from Singapore Changi Airport (SIN) on November 18 2014. Your flight will have two stops each way, one in Seoul and one in Hong Kong – no layover time exceeds 5 hours. Korean Air Skypass gives you 16,462 frequent flyer miles while you will gain 3,188 award miles from Cathay Pacific Marco Polo – the two airlines’ frequent flyer programs. Book the Multiple Airlines flight by Korean Air and Cathay Pacific for $866 r/t and save $50 in comparison to the next best fare, an Eva Air deal for $916 r/t. This entry was posted on Monday, October 13th, 2014 at 5:30 am and is filed under Airfare Deals. You can follow any responses to this entry through the RSS 2.0 feed. You can leave a response, or trackback from your own site.